Bloom is a practical parenting method that parents can use to connect and communicate with their children. Bloom focuses on what you can SAY, THINK and DO to handle these challenges. What You Can Say - Actual sentences you can say to your children in response to these challenges. What You Can Think - Sentences you can think in your head to keep yourself focused and calm enough to respond in a helpful way to the situation you’re trying to work on. What You Can Do - Practical and easy to implement tasks that will help you address the particular concerns. I’ve read a lot of parenting books, but not a ton have addressed physical aggression like they do here. 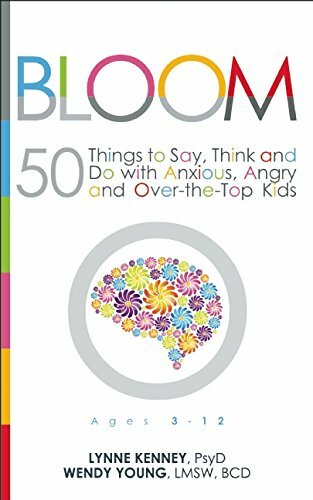 As a mom of a child who has gotten physically aggressive in the past, this was helpful for me, especially the THINK part. What You Can SAY - Anger and fear are BIG Feelings, but I can help you learn to handle them. What You Can DO - Provide hope by sending the message, hard feelings get easier to manage as you learn new skills. Bloom tackles challenging issues facing families today in an easy to understand and practical way. The HeartSmart conversations and activities are wonderful ways to build positive connections in your family through play and communication. The BrainSmart Mantras help adults stay positive and refocus on what matters. What a great resource!